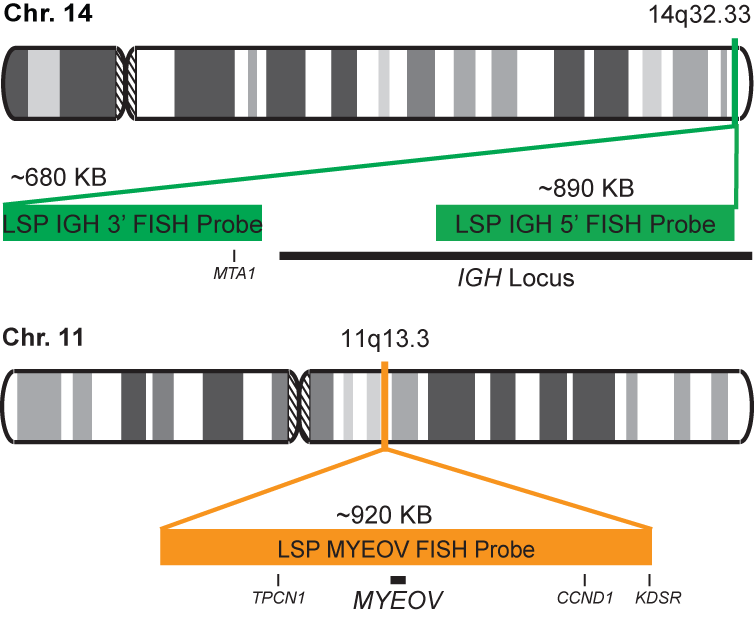 he IGH-MYEOV fusion FISH probe is designed to detect rearrangements involving regions of the human IGH locus, located on chromosome band 14q32.33, and the human MYEOV gene on 11q13.3. The FISH probe covers the chromosomal region that includes the entire MYEOV gene. The probe also spans the immunoglobulin heavy chain gene locus (IGH@) and consists of a portion matching the 5’ (start) region encoding variable gene segments (IGHV), and a part that covers the 3’ (end) and downstream sequences. This probe is flanking an area of the IGH gene comprising constant gene segments (IGHC) as well as the delta segment (IGHD), joining region (IGHJ) and epsilon domain (IGHE). Almost all known breakpoints in IGH@ have been mapped to this region.